The post I’m about to write today is a bit different from the ones I’ve already posted here on my blog. Such posts might appear here from time to time. Being interested in fashion and finished “Styling & Image-Making” and also “Personal Image & Beauty Expert” courses, I cannot not write about it ☺. With time you’ll probably notice that my style (most of the time) is “the simpler, the better” – I would say or as some people say “simple, yet classy and elegant”. One weekend my boyfriend ❤ and I decided to go for a spontaneous walk after doing some shopping. 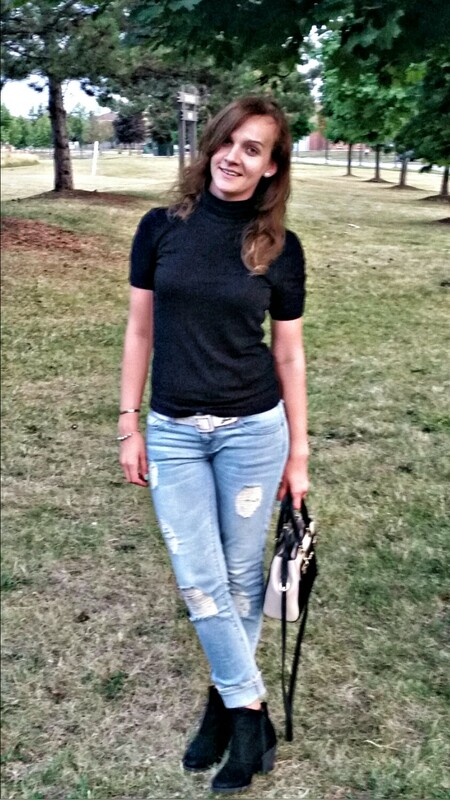 So as you can see in the pictures, I wore a black turtleneck with short sleeves (because it’s still summer time). Tip: Turtlenecks are great and most suitable for people with long necks. Black, on the other hand is always a good choice, in my opinion, there are no mistakes with this one. Lovely outfit. I agree with you … there is a lot of beauty in simplicity. That is my style as well! Thank you! ☺ So there’s two of us then 😊. LOL… a few people liked my comment so there are at least 4 of us… but I am sure there are many more. Cheers! Enjoy the long weekend! The outfit looks very cute on you ! Thank you so much! ☺ Yes, boyfriend jeans are great too 😊. You really look beautiful dear. You are welcome. I would like us to get to know each other to share some ideas on fashion. I love this elegant outfit ! I would definitely wear that outfit. I’d probably pair it with a pair of boots. I have a thing for boots so I wear them from September to May usually. 🙂 A great post! Thank you :). Oh, he was wearing Tommy Hilfiger jeans, a Guess T-shirt and Aldo shoes ☺. I you guys looked good together. hey , nice look dear!! Very classy yet simplistic style. Love your ripped jeans.., very ’90s! You can’t go wrong with a black turtleneck and blue jeans – such a classic! I like this simple but kind of edgy outfit. It spells out your classy and fun approach to fashion. You have a fun blog. I look forward to reading more posts! Happy Monday. Loving that turtle neck. You look nice. And of course there are times when simple is neither elegant nor classy. Lol. But it’s simple. But no turtlenecks, I don’t like things on my neck. Guess are my favorite jeans, but I like the older styles from the 90’s. I guess I am an old lady. The new styles wouldn’t look that good on me in my middle age. I don’t have the body I used to, but back in the day, Guess, was it. Thanks so much Ula. I do run into dry spells, where no matter how I try, nothing seems to come together. Don’t worry, I think that everyone has days like these :). I had over a month or more. getting back in the groove now. I’d like to say back with a vengeance, but we shall have to wait to see about that. I might wear ripped jeans even when I’m old haha, but who knows, maybe it’ll change 😊. You look great hun, everything you wear was totally beautiful. Such a great fashion statement. I love the outfit. Lovely of you to follow mine and I following yours. Thanks for following my blog…it led me to follow your wonderful blog! I look forward to reading more of your posts! P.S. Love the outfit ! I love that handbag- is it fuzzy? It looks fuzzy from here for some reason and just reminded me that I definitely want a fuzzy bag for fall/ winter! Thank you, but no, it’s not fuzzy, it looks like it though, I don’t blame you :). I have an outfit very similar to that one you are wearing. Black turtle necks and jeans are the best. I wear that sort of outfit when I am on a casual outing. Those boots gorgeous!had a pair just like them!